It's all about the experience. Do you want to feel like you are out in a monsoon, or a gentle summer rain? Or both? Kohler’s latest invention, Real Rain, allows you to feel both, as it mimics the feeling of the different phases of a summer storm. The water will feel like raindrops until you need an extra burst of power supplied by the "deluge" function. This sends half a gallon of water in 8 seconds through the center to replicate a heavy downpour. The showerhead drenches you with a flush of water that’s held in the pipe, imitating a monsoon. It's a great way to rinse the shampoo out of your hair. After studying what makes rain feel like rain, Kohler’s team of experts concluded that rain droplets vary in size and fall in a slightly irregular pattern. 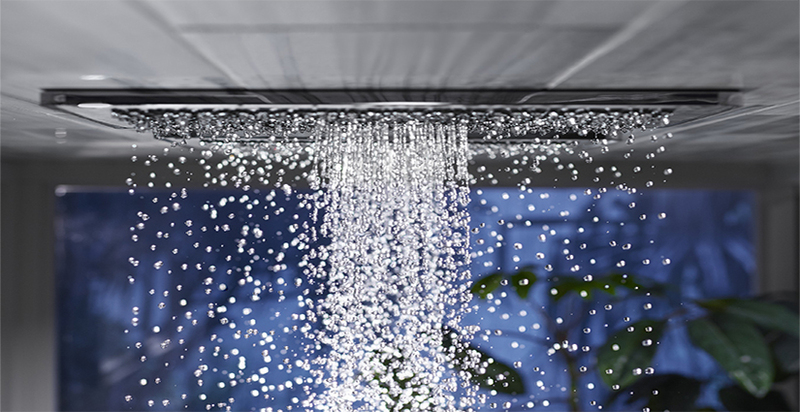 To encourage water to come out of the showerhead’s chamber like a raindrop through the sky, Kohler peppered this product’s surface with 775 concave nozzles in different sizes that allows water to flow through the panel in a manner that simulates rainfall. All of this tech comes in respectfully efficient with a flow rate of two gallons per minute when on normal settings. This is a shower panel that is both elegant and efficient. "It's a well-designed product that creates a unique showering experience," says Mark Bickerstaffe, Kohler's Director of New Product Development. The Real Rain shower panel can be configured and personalized. It comes with either a white or deep grey rain panel, with the perimeter panel trim available in all Kohler's standard finishes. Beyond that, you can choose whether you want it streamlined and traditional, or tech-savvy and automated. You can even pair your Real Rain with steam, water, and sound using a touchscreen. Maybe you'll go for the sounds of a tropical rainforest with a thunderstorm soundtrack!